(1965) "It's the Same Old Song"
"I Can't Help Myself (Sugar Pie Honey Bunch)" is a 1965 hit song recorded by the Four Tops for the Motown label. Written and produced by Motown's main production team Holland–Dozier–Holland, the song is one of the most well-known Motown tunes of the 1960s. The song reached number one on the R&B charts and was also the number-one song on the Billboard Hot 100 for two non-consecutive weeks, from June 12 to June 19 and from June 26 to July 3 in 1965. It replaced "Back in My Arms Again" by labelmates The Supremes, was first replaced by "Mr. Tambourine Man" by The Byrds, then regained the top spot before being replaced by "(I Can't Get No) Satisfaction" by The Rolling Stones. Billboard ranked the record as the No. 2 song of 1965. 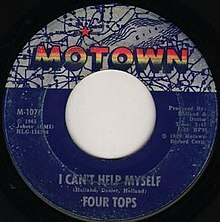 It was also the Four Tops first Top 40 single in the UK, reaching #23 on its original release, and a 1970 reissue peaked at #10 in the UK charts. The song finds lead singer Levi Stubbs, assisted by the other three Tops and The Andantes, pleadingly professing his love to a woman: "Sugar pie, honey bunch/I'm weaker than a man should be!/Can't help myself/I'm a fool in love, you see." The melodic and chordal progressions are very similar to the The Supremes' 1964 hit "Where Did Our Love Go," also written by Holland-Dozier-Holland. According to Allmusic critic Ed Hogan, the title "I Can't Help Myself" is an oblique acknowledgment by Dozier that he could not resist recycling his previous hit. Rolling Stone magazine ranked the song #415 on their list of the 500 Greatest Songs of All Time. It has been covered extensively since 1965, including versions done for several television commercials. Written by Brian Holland, Lamont Dozier, and Edward Holland, Jr. The Supremes recorded a cover of this song between 1965 and 1966, released on their #1 album, The Supremes A' Go-Go. Their backing band, The Funk Brothers, was also the Four Tops' backing band at the time and was composed of most, if not all, of the same musicians as the original #1 single. In 1967, the Four Tops themselves recorded a special Italian language version, entitled Piangono gli uomini (The men cry). In the winter of 1969, Johnny Rivers covered the song. His rendition became a #2 hit in South Africa. Donnie Elbert hit #22 on the Billboard Hot 100 in 1972 with his cover of this song, which was a follow-up to his cover of the Supremes' "Where Did Our Love Go." In 1980, Bonnie Pointer had a disco crossover hit, with the song peaking at #40 on the pop singles chart, #42 on the soul singles chart, and #4 on the dance charts. A cover by American country music group Billy Hill peaked at number 58 on the Billboard Hot Country Singles chart in 1989. The "Motorcity All-Stars" released a rerecorded version of song in 1989 on Ian Levine's Motown revival label Motorcity. The ensemble group was put together from as many former Motown singers as producer Levine could assemble. Levi Stubbs' brother Joe called Levi over to record the song, and both brothers feature on the track, along with singers Sammy Ward, Cal Gill of The Velvelettes, Carolyn Crawford and C.P. Spencer of The Originals, all of whom had previously recorded at Motown. Many other former Motown associates can be seen in the background of the accompanying video, including Berry Gordy's ex-wife Raynoma Gordy Singleton and former head of artist development Maxine Powell. ^ Whitburn, Joel (2004). Top R&B/Hip-Hop Singles: 1942-2004. Record Research. p. 212. ^ "Four Tops charts". officialcharts.com. Retrieved 2014-03-16. ^ Hogan, E. "I Can't Help Myself". Allmusic. Retrieved 2014-03-15. ^ "Four Tops – Piangono Gli Uomini / Bernadette (Vinyl)". Discogs.com. Retrieved 2014-11-28. ^ Whitburn, Joel (2010). The Billboard Book of Top 40 Hits. Billboard Books. p. 212. ^ Whitburn, Joel (2004). Top R&B/Hip-Hop Singles: 1942-2004. Record Research. p. 464. ^ Whitburn, Joel (2004). Hot Dance/Disco: 1974-2003. Record Research. p. 205. ^ "Bonnie Pointer – I Can't Help Myself (Sugar Pie, Honey Bunch)". Discogs.com. Retrieved 4 January 2015. ^ Whitburn, Joel (2013). Hot Country Songs 1944–2012. Record Research, Inc. p. 41. ISBN 978-0-89820-203-8. ^ "The Motorcity All-Stars* - I Can't Help Myself (Sugar Pie Honey Bunch) (Vinyl)". Discogs.com. Retrieved 2016-09-29. "Baby I Need Your Loving"
"Without the One You Love (Life's Not Worth While)"
"I Can't Help Myself (Sugar Pie Honey Bunch)"
"It's the Same Old Song"
"Shake Me, Wake Me (When It's Over)"
"Loving You Is Sweeter Than Ever"
"Reach Out I'll Be There"
"Standing in the Shadows of Love"
"7-Rooms of Gloom" / "I'll Turn to Stone"
"I'm in a Different World"
"Do What You Gotta Do"
"Don't Let Him Take Your Love from Me"
"It's All in the Game"
"Just Seven Numbers (Can Straighten Out My Life)"
"Walk with Me, Talk with Me, Darling"
"(It's the Way) Nature Planned It"
"Ain't No Woman (Like the One I've Got)"
"I Just Can't Get You Out of My Mind"
"One Chain Don't Make No Prison"
"We All Gotta Stick Together"
"I'm Glad You Walked into My Life"
"When She Was My Girl"
"Let Me Set You Free"
"Tonight I'm Gonna Love You All Over"
"I Believe in You and Me"
"I Just Can't Walk Away"
"Old Love (Let's Try It Again)"
"Darling, I Hum Our Song"
"What Goes Up Must Come Down" / "Come on Home"
"Tie a String Around Your Finger"
"Come and Get These Memories" / "Jealous Lover"
"You Lost the Sweetest Boy"
"Heat Wave" / "A Love Like Yours (Don't Come Knocking Everyday)"
"(He Won't Be True) Little Girl Blue"
"Too Hurt to Cry, Too Much in Love to Say Goodbye" / "Come on Home"
"When the Lovelight Starts Shining Through His Eyes" / "Standing at the Crossroads of Love"
"I Gotta Dance to Keep From Crying"
"Quicksand" / "Darling I Hum Our Song"
"Live Wire" / "Old Love (Let's Try It Again)"
"Run, Run, Run" / "I'm Giving You Your Freedom"
"Can I Get a Witness"
"My Lady Bug Stay Away from That Beatle"
"Like a Nightmare" / "If You Were Mine"
"Baby Don't You Do It"
"Baby I Need Your Loving" / "Call on Me"
"Candy to Me" / "If You Don't Want My Love"
"Whisper You Love Me Boy"
"Baby Love" / "Ask Any Girl"
"Come See About Me" / (You're Gone But) Always in My Heart"
"Without the One You Love (Life's Not Worth While)" / "Love has Gone"
"Stop! In the Name of Love" / "I'm in Love Again"
"You've Been a Long Time Coming"
"Who Could Ever Doubt My Love"
"Back in My Arms Again" / "Whisper You Love Me Boy"
"The Only Time I'm Happy"
"Mother Dear" / "He Holds His Own"
"Nothing but Heartaches" / "He Holds His Own"
"Love (Makes Me Do Foolish Things)"
"It's the Same Old Song" / "Your Love Is Amazing"
"Mother Dear" / "Who Could Ever Doubt My Love"
"I Hear a Symphony" / "Who Could Ever Doubt My Love"
"Take Me in Your Arms (Rock Me a Little While)"
"There's a Ghost in My House"
"This Old Heart of Mine (Is Weak for You)"
"My World Is Empty Without You"
"Shake Me, Wake Me (When It's Over)" / "Just as Long as You Need Me"
"Helpless" / "A Love Like Yours (Don't Come Knocking Everyday)"
"Love Is Like an Itching in My Heart" / "He's All I Got"
"I Like Everything About You"
"I Guess I'll Always Love You"
"Love's Gone Bad" / "Put Yourself in My Place"
"You Can't Hurry Love" / "Put Yourself in My Place"
"Little Darling (I Need You)"
"Reach Out I'll Be There" / "Until You Love Someone"
"Stay in My Lonely Arms"
"You Keep Me Hangin' On" / "I Wanna Mother You, Smother You With Love"
"You Keep Me Hangin' On" / "Remove This Doubt"
"Standing in the Shadows of Love" / Since You've Been Gone"
"Heaven Must Have Sent You"
"Love Is Here and Now You're Gone" / There's No Stopping Us Now"
"Jimmy Mack" / "Third Finger, Left Hand"
"Bernadette" / "I Got a Feeling"
"The Happening" / "All I Know About You"
"Your Unchanging Love" / "I'll Take Care of You"
"Reflections" / "Going Down for the Third Time"
"You Keep Me Running Away" / "If You Don't Want My Love"
"In and Out of Love" / "I Guess I'll Always Love You"
"We've Got a Way Out Love"
"(You've Got Me) Dangling on a String"
"The Day I Found Myself"
"Don't Leave Me Starvin' for Your Love"
"Why Can't We Be Lovers"
"Where Do I Go from Here"
"I'm Gonna Let My Heart Do the Walking"
"We Can Never Light That Old Flame Again"
This page was last edited on 28 March 2019, at 22:53 (UTC).